There are many ways we make your visits with us more pleasant. We have made great efforts to assure that our patients feel welcome, comfortable and confident in our team. Only then can you make the appropriate choices regarding your treatment. 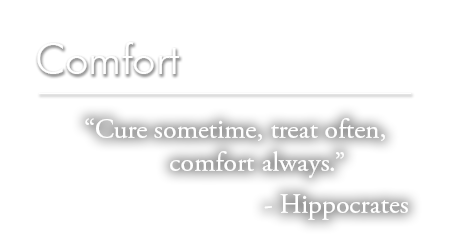 Consistent with our philosophy, we strive to always be sympathetic and understanding to our patient’s needs. Some people have very deep-seated fears that keep them from receiving the care they may need. We are very considerate of those fears and have a range of techniques to address them. Regardless, a gentle, caring touch is always used during any visit to our office. This type of sedation is administered by breathing a safe mixture of gases that helps you remain relaxed, yet awake, during a procedure. It’s effects are noticed quickly, and recovery time is very rapid. Oral Sedation is induced by taking a safe sedative pill by mouth shortly before your appointment. It’s effects are noticed more slowly, and a deeper level of sedation is accomplished. This type of conscious sedation provides the most comfort and relaxation, and is carried out by giving the sedative medicine intravenously. Of the three we offer, it is the most effective type of conscious sedation. We have gone to great lengths in order to provide a calming atmosphere during a visit to our office. Above all else, we want our patients to feel welcome and comfortable in our facilities and with our team.